Don't know how things happened but I'm kinda crazy about makeup and skincare products lately. 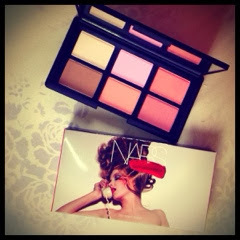 So much so that I splurged on the NARS' One Night Stand blush palette that was a Sephora exclusive.. Perhaps I should be more specific; it was a Sephora US exclusive! Yes, this palette came all the way from the American Sephora. And yes, I get a little crazy when I want something! But I am happy with the purchase. It was a lot of money, but I've been wanting NARS' blush anyway so what the heck! NARS stand-alone store is opening on the 15th this month (so I've heard) in Pavilion and I am ridiculously excited about it! Their Radiance Creamy Concealer is pretty much my holy grail concealer and I love LOVE the Larger Than Life Eyeliners.. So yeah, I know exactly what I'm getting once the store is open! Sorry that this entry somehow became purely beauty-related. Like I said earlier, I really don't know how things happened.. I am just excited about these things lately. Hahaha... well I was like that once ;p welcome to the beauty world! Oh BTW saw your comment on chocolatecats on how much is Nars foundation, If you are interested Please check my blog. I've list the prices there.